No matter what some may say, nothing rocks the world of hair dye like burgundy. Edgy, yet feminine and stylish, burgundy helps you stand out from any crowd anytime, anywhere. The interesting undertones of wine-red and purple turn burgundy into the right and natural choice of anyone loving to try new things. Is burgundy a good choice for black hair? Don’t worry about your hair being black as there’s a shade to match it for sure. No matter if you’re a natural black hair or not, you’re going to be able to find the right shade of burgundy for you too. 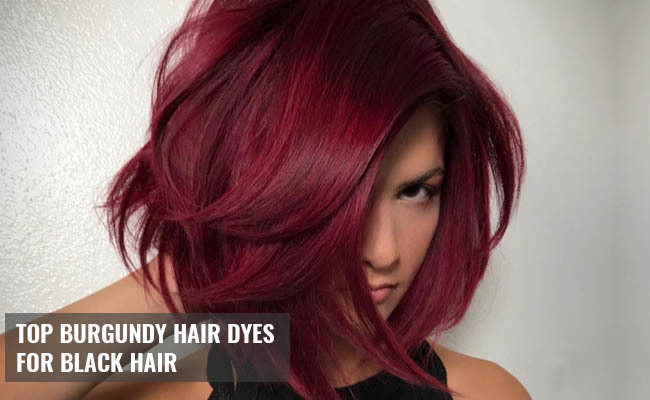 Even if it seems like a lot of work, you can pull a burgundy color for your black hair right from the comfort of your home. Truth be told, going burgundy on a black hair isn’t the easiest job, as the chances for ending up with some brown and not burgundy hair are quite high. Therefore, it’s fundamental to bleaching your hair first for getting that nice color of burgundy. As long as you’re all aware of the fact that bleaching your hair may damage it and you know what bleaching is all about, there’s no reason for you not to try it at home. Apart from the hair bleach powder and the developer, you’re also going to need gloves, brush and the burgundy hair dye. You should start with not washing your hair two days prior bleaching. When you’re bleaching your hair, you should only leave the bleach for 15 minutes, until you get a nice shade of brown. Continue with washing your hair and allow it to dry. Once your hair is all nice and dry, you should apply the burgundy hair dye nice and easy, as the instructions on the box say. Rinse your hair when time is up and finish with applying your shampoo and conditioner. 1. Going shopping on a tight budget is no picnic but you don’t necessarily have to come back home empty handed. The SoftSheen-Carson Dark and Lovely Fade Resist Rich Conditioning Color, Berry Burgundy is going to make quite an impression on you and it’s not going to empty your pockets either. The ultra-conditioning hair dye may last up to 8 weeks and gives a nice and rich color. It protects the relaxed and natural hair and provides good coverage for the grays too. Its conditioner is nourishing as it’s formulated with 3 fruit oils: avocado, shea and olive. 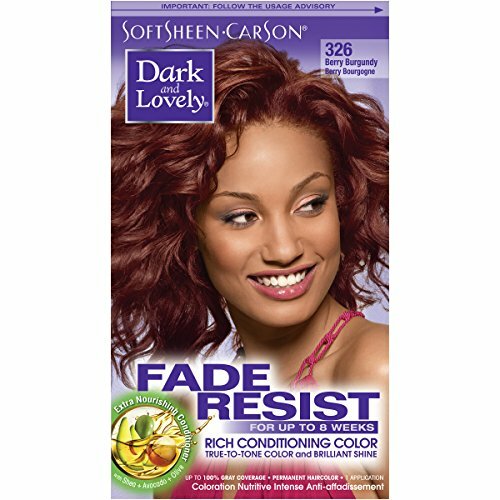 Especially formulated for the women of color, the hair dye leaves your hair shiny and lustrous. Dependable and less damaging for your hair, the hair dye is quite the bang for your buck. 2. Leading to long-lasting and high-definition color, the Revlon Colorsilk Beautiful Color, Burgundy isn’t just a dependable choice for the black hair, but also an affordable option. 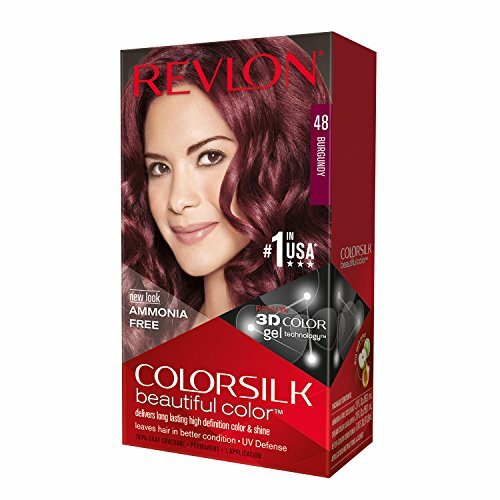 The Revlon 3D Color Gel Technology is going to ensure rich and multi-tonal color, from roots to the tips of your hair. The hair dye is also enriched with UV defense so that the color remains multi-faceted and vibrant for longer time. The formula is ammonia-free and based on nourishing silk proteins that leave your hair shiny, healthy and easier to detangle. However, the hair dye gives nice and durable results and it doesn’t break the bank either. 3. 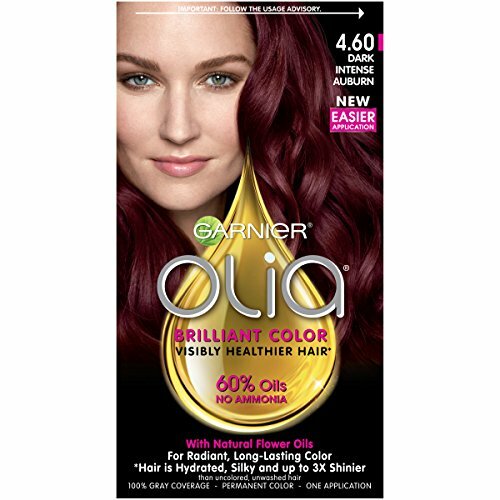 The ammonia-free formula of the Garnier Olia Hair Color, 4.60 Dark Intense Auburn, Ammonia Free Red Hair Dye is one good reason for anyone to try this hair dye, but the hair dye sure brings a lot more to the table. The hair dye has a pleasant scent and leads to brilliant and long lasting color on your hair. It leaves your hair silky smooth and well hydrated. It’s a permanent hair dye that covers grays pretty well. The rich formula is made with 60% natural flower oils that don’t weigh down your hair. However, the hair dye isn’t the best option for an oily hair. Easy to mix and to apply, the hair dyes ensures even results and restores your hair. Regardless of the minor issues, the hair dye gives even and radiant color on your hair and smells so very nice. 4. 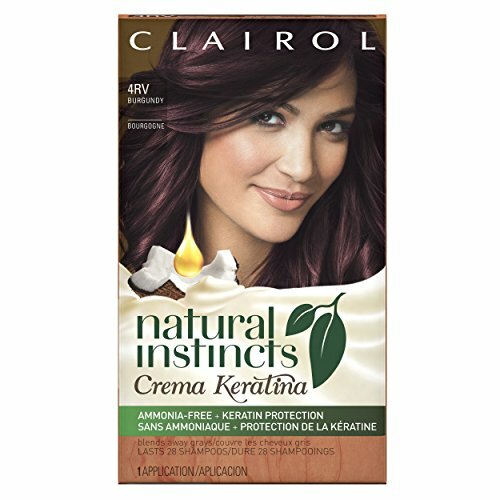 If you’re looking for a non-permanent hair dye for your black hair, don’t hesitate to try the Clairol Natural Instincts Crema Keratina Hair Color Kit, Burgundy 4RV Eggplant Crème. the non-permanent hair color system is made with keratin, which means it reduces the damage of your hair when coloring it. The ammonia-free formula works even on the darkest hair in only 20 minutes. The hydrating conditioner is formulated with coconut oil, eliminating frizz and leaving your hair smooth and silky. The cream consistency makes application a breeze and one box is enough for long and curly hair. The hair dye rinses out easily and the color is so rich. RELATED POST: Grapeseed Oil- Why Use It for Your Skin and Hair? Nevertheless, for the ammonia-free formula, nice conditioner and nice results, you shouldn’t sit on the fence about this one. 5. Ready to use out of the box so checking the box of easy use, the Adore Semi-Permanent Haircolor is a great option for anyone who’s interested in the less complicated hair dyes. The hair dye is a semi-permanent hair color and gives beautiful results. It has a pretty smell and using it is a breeze. It doesn’t contain ammonia, alcohol or peroxide. The color lasts for a good amount of time and the hair dye is very easy to apply. It leaves your hair pretty colored, but also softer and with a sensual feel to it. It’s quite good value for the money. Beggars cannot be choosers and, for the buck you’re paying, the hair dye is always a good buy. 6. 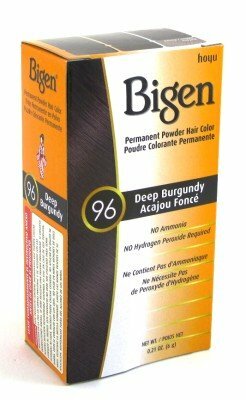 The permanent powder hair color from Bigen Permanent Powder Hair Color, Deep Burgundy doesn’t just lead to vibrant color for your hair, but also covers grays pretty well. Its formula doesn’t contain any harsh ammonia or peroxide so the hair dye is safe to use on all hair types. The results are quite durable and the hair dye enhances your natural hair color. You don’t need to use a developer for this one, as water is going to be enough. The hair dye protects your hair and the risk for damage is minor. It leads to a nice and dimensional color too. All in all, for a very good price, you get a hair dye that gives nice results without damaging your hair nor empty your pockets. 7. 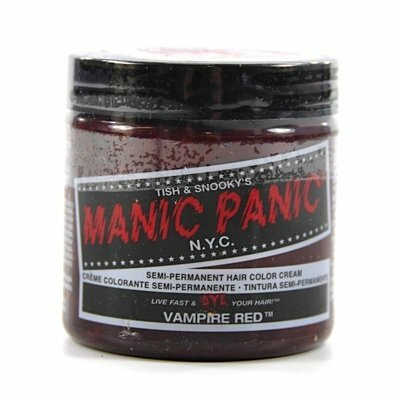 When burgundy isn’t enough of a color for you and you want to spice up the things with a deep and sanguine shade of burgundy, you should definitely take a leap of faith with Manic Panic Vampire Red Hair Dye. The semi-permanent hair color is formulated on conditioners that moisturize your hair. You don’t just get a bold and impressive shade of burgundy on your hair, but also a nice and soft feel for your hair. The hair dye has just the right consistency for an easy application and quite a beautiful smell. It dries out fast and its results may get you good for 4-6 weeks, as long as you’re taking good care of your hair. On top of everything else, the hair dye is also vegan friendly and comes for a great price. Having said that, for the intense and bloody burgundy that you get on your black hair, you should try the hair dye asap. 8. 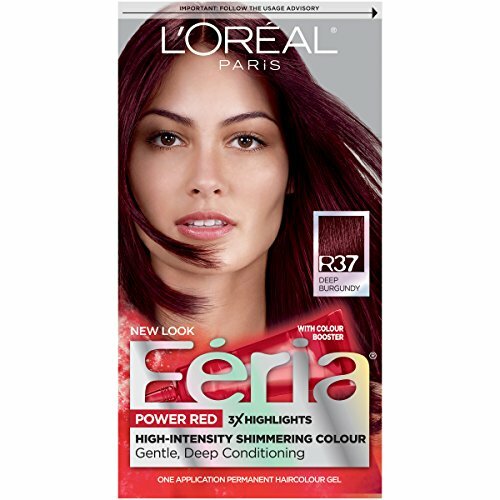 Just because the popularity of the L’Oréal Paris Feria Permanent Hair Color, R37 Blowout Burgundy (Deep Burgundy) is high, it doesn’t mean we shouldn’t take a better look at the details. The hair dye gives permanent results and the color never gets dull or flat. The hair dye doesn’t damage your hair and the Multi-faceted shimmering color is pretty impressive. It ensures brilliant and intensified results. As for the Power Shimmer Conditioner, you can also rely on it as it hydrates and conditions the hair for a long time, protecting it from damage. Regardless of the minor issues, for the vibrant and prismatic color, there’s no obvious reason for which you shouldn’t try the hair dye on your black hair strands. 9. 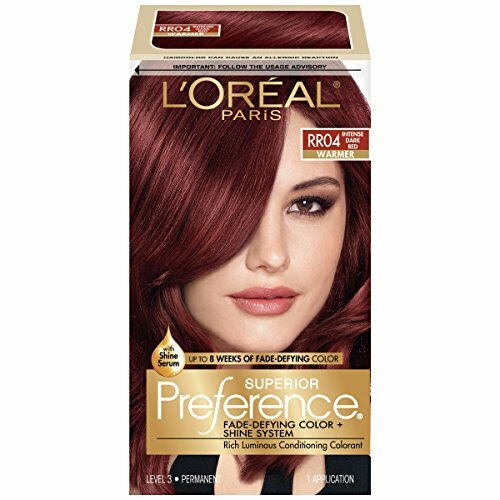 Great for dying black hair but also for covering so nicely the grey ones, the L’Oréal Paris Superior Preference Permanent Hair Color, RR-04 Intense Dark Red should be on your shopping list. The hair dye is made with Fade-Defying Color plus Shine System so this means that the color doesn’t fade out easily. The translucent gel formula is easy to use and the Supreme Conditioning Treatment conditions your hair efficiently. The color is long lasting and has a nice dimension and depth. The hair dye doesn’t dry nor damages your hair. the hair loss is minor and the dye washes out pretty fast. It doesn’t stain and leaves your hair soft and shiny. Nevertheless, for the nice resistant color and nourishing formula, you should definitely try L’Oréal Paris Superior Preference. 10. 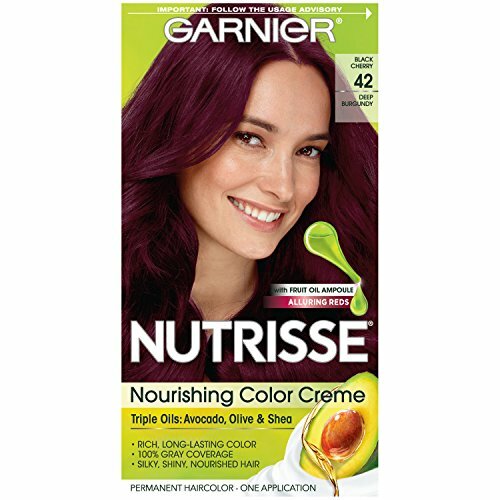 As long as you’re bleaching your black hair before using the burgundy hair dye, you shouldn’t have any problems getting a nice shade when using the Garnier Nutrisse Nourishing Hair Color Crème, 42 Deep Burgundy (Black Cherry). Easy to use and affordable, the permanent hair dye presents a nourishing formula containing olive, avocado and shea oil. The hair color cream comes also with an ampoule of grape seed oil so you may easily begin with nourishing your hair as you go. You may use the nourishing avocado conditioner right the way or any time after that, up to 14 days later. The hair becomes shiny and lustrous and the color doesn’t transfer. The smell isn’t strong at all. As long as you’re focused on the goods, which are plenty, you can definitely have your shot with Garnier Nutrisse. 11. 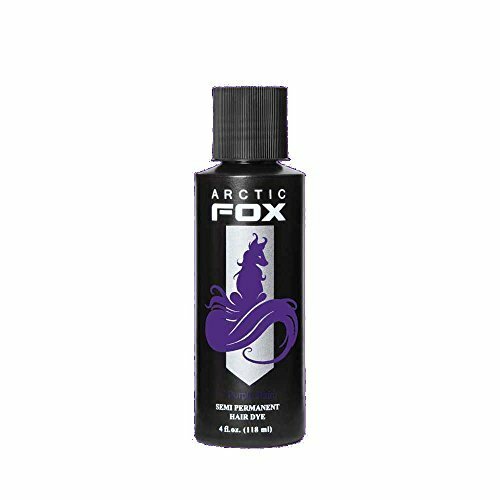 Made only from vegan ingredients and containing no animal by-products, the Arctic Fox 100% Vegan Semi Permanent Hair Color Dye is a valid option for black hair. The semi-permanent hair color dye has no harmful chemicals so the risk for damaging your hair is minor. It’s gentle for constant use and conditions your hair efficiently, giving your hair a vivid color. The color lasts for quite some time and the hair dye has a subtle and pretty smell. It leaves your hair soft and shiny and the hair dye is easy to rinse out. No matter the cons, for the vegan formula and vivid color, you should definitely try the Arctic Fox at least once. 12. 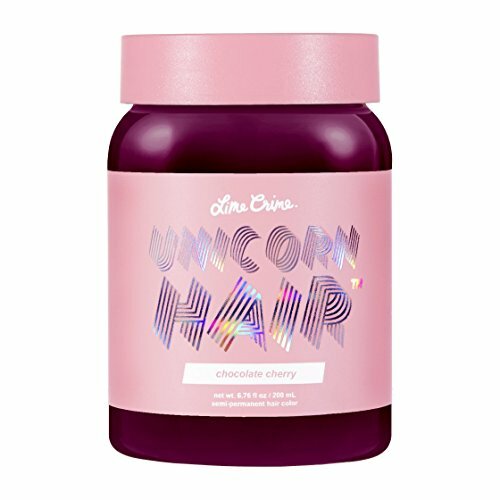 Vegan and cruelty free, the Lime Crime Unicorn Hair – Chocolate Cherry (Full Coverage) Deep Burgundy Red Semi Permanent Hair Dye gives not only vibrant burgundy color on your hair, but also long lasting results. Even if it’s not a permanent hair dye, the hair dye manages to lead to beautiful and vibrant colors. The coverage is good and the color doesn’t fade out fast. You need barely bleaching before using the hair dye. In order to stay on the safe side, it’s better to run a patch test first. The hair dye comes ready to use so you don’t need to worry about mixing lighteners, developers or any other permanent hair colorant. All things considered, as it leads to vibrant and beautiful burgundy color hair, you should try it, especially if you’re into the vegan and cruelty-free cosmetics. 13. 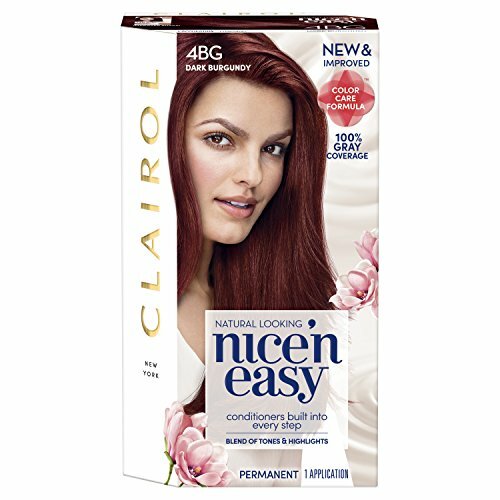 For those of you who’re looking for a natural burgundy look for their hair, the Clairol Nice ‘N Easy Permanent Hair Color, 4Bg Dark Burgundy may be just the right choice. The hair dye is going to ensure nice coverage of grays, but it’s also going to add complementary highlights and lowlights for an original look. The permanent color is going to last for 8 weeks or so. The kit includes everything you need for dying your hair. The hair dye has a pleasant floral scent and it presents a non-drip formula for a clean application. Easy to use, the hair dye leaves your hair soft and silky and with a vibrant burgundy color. Far from being a lemon, the hair dye is easy to use, smells nice and gives a vibrant burgundy color on your black hair. Why not try it? 14. Especially formulated for brunettes, the L’Oréal Paris Colorista Semi-Permanent Hair Color for Brunettes, Burgundy doesn’t just lead to a beautiful burgundy color on your black hair, but it also has a vegan formula. The hair dye is a semi-permanent option that doesn’t contain any animal derived ingredients nor byproducts. You don’t need to bleach your hair when using the hair dye, which lowers the risk for damaging tour hair too. The hair dye doesn’t contain any ammonia or peroxide either. Easy to apply, the hair dye doesn’t have a strong smell and its results last up to 4 to 10 shampoos. All in all, the semi-permanent hair dye gives beautiful results on your black hair and doesn’t need bleaching. Isn’t that enough for you? 15. 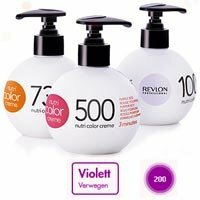 Great for boosting your color between salon visits, the Revlon Nutri Color Crème 200 Burgundy is worth to try whenever you’re willing to pay the extra buck for your hair. The hair cream is going to refresh your color nice and easy and its deep conditioning treatment moisturizes your hair, leaving it silky smooth. The hair dye doesn’t contain ammonia or peroxide and has a pleasant smell. 1 bottle is going to be enough for 12-15 applications. The color you get is great and vibrant and the hair cream is easy to use. However, you still need to wear gloves for applying it. Even if its price may be a pet peeve for some, the hair cream is still a solid option for your black hair.